All of our guinea pigs and rabbits are 100% gender guaranteed and are healthy when they leave the rescue. 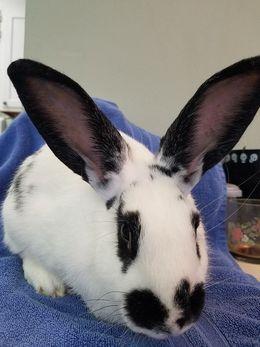 All rabbits are spayed or neutered prior to adoption. An online adoption application is completed. We will respond to your application as soon as possible to ask any additional questions we may have and to schedule a visit. We strive to respond within a few days, but it may take up to a week or two as we are all volunteers with full-time jobs. Please have patience with us; we are happy that you are excited to bring piggies or bunnies into your home, we WILL reply to you. A visit is made to meet the animals, see the cages and to gain any education / advice needed. You may at this point select your animal(s). You go home to get prepared for your newcomers, assemble the cage, buy supplies, etc. You will come back the next Saturday to pick up your piggies and take them to their new home. The adoption process can be limited to one visit. You must have your cage ready before the piggies or bunnies go home. To assist you with this process, we recommend you view our Caging link or you study them at our Rescue on your first visit. Store-bought “guinea pig cages” and "rabbit cages" are never large enough. To assist you, you can either purchase cage supplies to assemble an approved cage on your own, or purchase the supplies from Texas Rustlers. We have all supplies needed to start your guinea pigs in their new home, including all materials required to assemble a cube and coroplast cage, quality hay and food treats, houses, toys, and more. We request a $35 adoption fee for each single guinea pig, $30 each if adopting a pair or $25 each if adopting a trio, which goes towards some of our operating costs. Rabbits are $80 each or $120 per pair. We do not adopt animals as gifts. We do not adopt animals as a classroom or day care pet, nor as a pet for any setting with a group of children. We only adopt guinea pigs in pairs (or trios), or as a friend to your existing piggy. 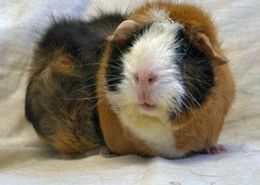 Guinea pigs should not live alone, as they need the companionship of another of their kind. We do not allow our animals to be used for the purposes of breeding, showing or experimentation.